There are correct and incorrect ways to end your PROCAS accounting session. Often, users will click the white X at the top middle of their PROCAS session. This is called disconnecting from the server. Disconnecting from the server is different from logging off the server. When you disconnect from the PROCAS server, any reports and forms that you may have had open will continue to remain open, even though you are not actively connected to the server. This is a lot like your computer going into “sleep” mode when left inactive, leaving applications running in the background. If you log in within ten minutes of disconnecting, everything will be as you had left it. Disconnecting from the server is beneficial if you are changing computers or just stepping away for a few minutes. If you happen to leave your computer idle for two hours, the system will automatically disconnect your session. If you do not log back in within ten minutes of being disconnected, the system will then automatically log you off the server. Disconnecting from the server may be problematic if your company has other accounting users that are working in the software. Disconnecting from the program will keep all reports and forms open. This will place a lock on all open records, which will prevent other users from editing any information while you have the files open. A build-up of locked files can also create a misalignment between the data tables, which will require a re-index to continue working. If your company has multiple accounting users that share a server license, disconnecting from the server can give unauthorized users access to forms and reports they are not supposed to access. To prevent these types of issues, we recommend logging off the server instead of simply disconnecting. Properly logging off the server is a lot like shutting down your computer. Any forms or reports that were open will be closed and password protected when you log off. To get back into the software, you will need to open the application and sign in. To best safeguard your assets, it is imperative that you limit access to your data to authorized users only. This prevents anyone else from being able to access and modify your data without permission. Logging off the server ensures that all records are saved and all locks on the data tables are cleared. To maximize the security of your data, we encourage you to log off or disconnect when stepping away from your computer. *This step should be followed regardless of which method of logging off is used. Option 1: Click on the Start button in the lower left-hand corner of your remote desktop session, then click LOG OFF. Option 2: Click File in the upper left-hand corner of the window then click Exit. 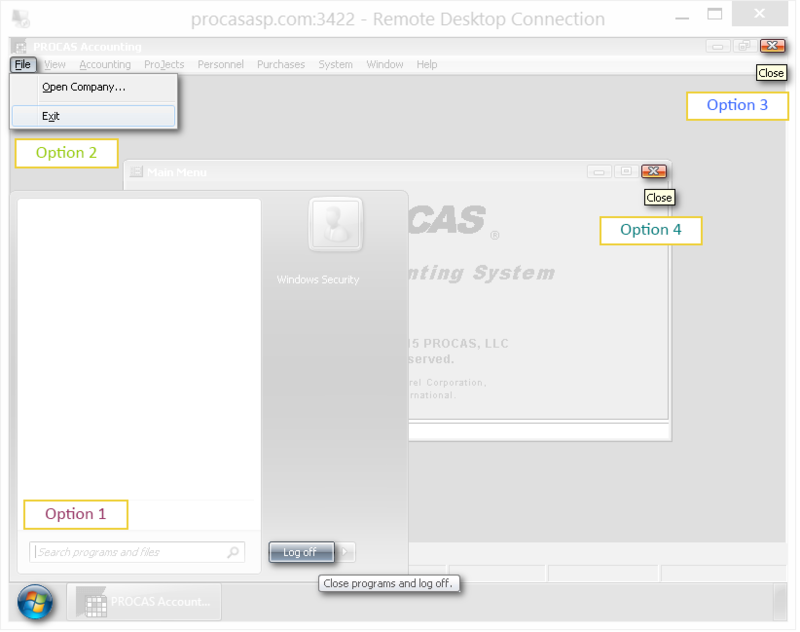 Option 4: On the PROCAS Main Menu, click on the red X on the upper-right hand of the pop-up window. When asked “Are you finished with this program?”, click YES. Click on the X that appears on the blue bar, located in the upper-middle portion of the Remote Desktop Connection window.